Did You Hear About the One(s) That Got Away? It’s a given that French men are difficult. Not only is my husband French, but he is also stubborn so I think I can safely say that he is a one-man “double whammy.” For our Atlantic Ocean crossing, we estimated that it would be a 30-day passage. However, one must prepare for the unforeseen: multiple windless days, perhaps equipment breakdowns…any number of things or events that could prolong the trip. With this in mind, we made an effort to store enough provisions for two months. We did hope that we would catch some fish to supplement our diet, and vary the meals, but that certainly wasn't a given so we couldn’t count on it. We decided that whatever fish we would catch would be a welcome surprise bonus. With this in mind, Michel, who is not a fisherman, set about learning how one should fish while sailing, especially in deep ocean waters. We had quite a few sailing books full of “how-to” tips and tales of others’ voyages in our on-board library. Each author recounted multiple tricks, fail-safe methods, and “guaranteed-to-catch” fishing tips. With a minimum of 30 days of sea ahead of us, he had plenty of time to study the question, so Michel settled on a technique he devised, culling from several sources in our library. It seems the most important idea he came away with was that of creating an environment similar to a school of fish. This seemed to be a favored tactic. 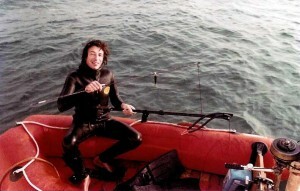 To create such an effect from the vantage point of our deck, Michel set out to devise a way of spreading out multiple fishing lines that would trail behind the boat, all different lengths sporting varied lures and bait paraphernalia, so as to give the impression that we were a school of small fish, so that we could attract some bigger fish. Sailboats such as ours carry at least one spinnaker pole on deck, used for the downwind sail known as a "spinnaker." The pole specifically holds a bottom corner of the sail, jutting well out over the water so as to capture the most wind possible as a boat sails in a downwind position, or with the wind at our back, pushing the boat along. Since we knew that eventually part of our trip was to take us across the Atlantic, east to west, this meant we would probably have a 30-day downwind trip, as the course was charted, being pushed by seasonal trade winds. Thus, in order to get the maximum speed out of our boat, we equipped Cowabunga with two spinnaker poles—the idea being that we could use two downwind sails hoisted at the same time, on either side of the boat, putting us in a "wing 'n wing" position. Both our poles were about 15 ft. long, so with our big genoa sails, this gave us a lot of sail area over the water. Consequently with two poles, we had a combined total of about 30 ft. in length of potential fishing area extending out perpendicularly from the lower end of the mast over the water on both the port and starboard (right and left) sides of the boat, to which Michel could attach numerous fishing lines and hopefully create an impression of our being escorted by a school of fish. So, he set about tying many, very long fishing lines to each pole. Long strands of lines started from the poles above the water, and finished by trailing in the water well behind the boat, all different lengths and with different multi-colored lures. Cowabunga looked something similar to a salmon or tuna fishing trawler with their fishing lines hanging off each side of the boat, except that our lines were multiplied by at least 10 per side. It all looked very earnest and serious, and this was all well and good. Now all we had to do was just wait for the big bite! Even though the sailing was fairly calm and predictable on this passage, Michel would occasionally tweak the sails, or the wind vane pilot along with other various maneuvers in an attempt to give us the best possible speed and comfort level. One afternoon the wind slightly shifted and we needed to change our angle downwind a bit. The fishing lines had been up for several days, with no nibble yet, and they had become part of our on-deck landscape, blending into the routine, becoming almost unnoticeable. Michel shifted the angle of the wind vane, which shifted our compass direction, which caused the trailing fishing lines in our wake to converge from the left side to the right side, all mixing and mingling until they became one big splashy tangled web of a ball trailing behind us. No fish was going to tackle that. If anyone thinks one can be bored on a 30-day passage, you haven't tried to untangle 20 very long fishing lines. Michel sat at the back of the boat for a good several days, untangling his "school of fish." One would think such an experience would be enough of a lesson, and that the "spinnaker pole" technique was not ideal. I did say that this Frenchman was stubborn. Michel was determined to "try, try, again," each attempt with new and improved techniques, only to result in several more tangled messes. Needless to say, he didn't have much time to be bored on our passage. We finally finished with one, maybe two lines at a time, and eventually did catch a few fish.